"Cyclone" usually refers to an extra-tropical (non-tropical) cyclone, which is a low pressure area that forms near the boundary between warm and cool air masses. (It alternatively refers to a hurricane that forms in the Indian Ocean). 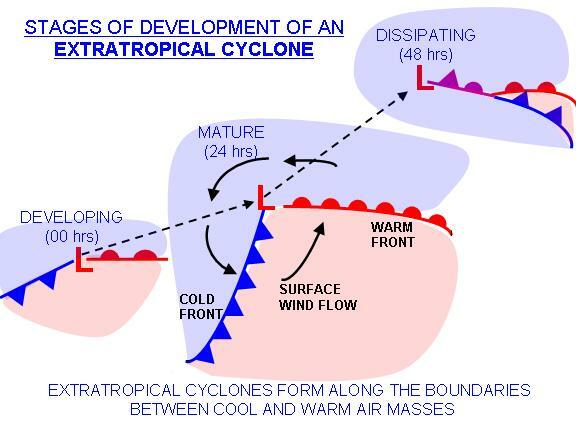 As depicted in the illustrations above and below, the cyclone grows in size and intensity as it draws on the energy that is available from the temperature contrast between the two air masses. The leading edges of the airmasses that are moving are called fronts. The imaginary line where the warm air meets the cold air at the surface in advance of the low pressure center is called a warm front. Where the cold air advances upon the warm air is called a cold front. As some of the warm air rises up over the cold air mass, and some of the cold air sinks and flows under the warm air mass, the cyclone "deepens" (the air pressure becomes lower) and the winds around the system increase. After a few days, most of the energy that was available to the cyclone is used up, and the cyclone slowly dies. During its lifetime, the cyclone has most likely moved from low latitudes to higher latitudes. In this way cyclones accomplish much of the heat transfer from the tropics to the higher latitudes, and help to maintain the general circulation of the atmosphere. Almost all winter storms are associated with extratropical cyclones. If this all sounds complicated...it is. 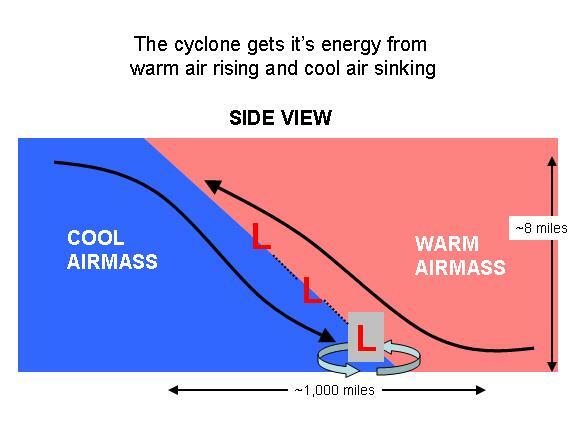 The important thing to remember is that cyclones are nature's way of reducing the temperature contrast between air masses, since that contrast represents 'potential energy' -- somewhat like the water behind a dam represents potential energy that can be converted to electricity.